Stem cell-mediated tissue repair is a promising approach in regenerative medicine. Intestinal epithelium is the most rapidly self-renewing tissue in adult mammals. Recently, using lineage tracing and molecular marker labeling, intestinal stem cells (ISCs) have been identified in Drosophila adult midgut. ISCs reside at the basement membrane and are multipotent as they produce both enterocytes and enteroendocrine cells. The adult Drosophila midgut provides an excellent in vivo model organ to study ISC behavior during aging, stress, regeneration, and infection. It has been demonstrated that Notch, Janus kinase/signal transducer and activator of transcription, epidermal growth factor receptor/mitogen-activated protein kinase, Hippo, and wingless signaling pathways regulate ISCs proliferation and differentiation. There are plenty of genetic tools and markers developed in recent years in Drosophila stem cell studies. 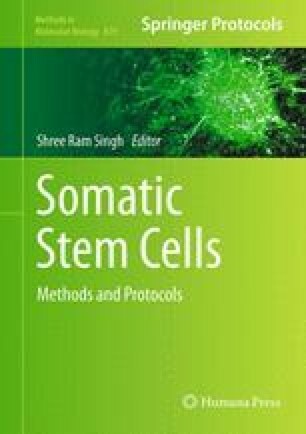 These tools and markers are essential in the precise identification of stem cells as well as manipulation of genes in stem cell regulation. Here, we describe the details of genetic tools, markers, and immunolabeling techniques used in identification and characterization of adult midgut stem cells in Drosophila. M.K.S. is supported by the Knight’s Templar Eye Foundation and start-up support from the University of Dayton, OH. This research was supported by the Intramural Research Program of the National Institutes of Health, National Cancer Institute.